Degenerative Disc Disease (DDD) is a phrase that originated many decades ago to describe what is more commonly known as 'ageing' of the intervertebral disc. Despite being very common in adults, it is very difficult to speculate the exact occurrence rate due to broad variations in published research. What we do know is that the older we get, the more chance we have of developing it, HOWEVER, advancements in research are now suggesting that up to three quarters can actually be attributed to genetic factors. It is very important to understand that despite the name, this is not really a disease in the truest sense. Many professionals believe that the 'disease' stigma alone can be detrimental with some personalty traits developing inappropriate beliefs and expectations thereby increasing the likelihood of chronic pain. Hopefully the following will help to dispel some of the misnomers and beliefs that we commonly hear regarding this. For the sake of this article we will concentrate of the lumbar spine, that is the lower part of your back. You will then be able to apply the principles of this throughout the spine to fit broadly you own presentation or condition. This outer structure consists of between 15 to 20 sheets of fibrocartilage (Type 1 & Type 2 collagen) that we call lamella. These are a type of strong, inelastic, protein similar to those that make up your ligaments. In cross section they look very similar to a sheet of plywood having a unique design where by each layer runs at 120 degrees when compared to its neighbour. This type of structure has a naturally high resistance to tension (stretching force) however a low resistance to compression (squashing). Between these layers is an elastic coating which helps the overall disc structure adapt to different loads and forces and reduce the chance of injury and/or failure. This viscous (thick) liquid, similar to the elastic coating in the annulus described above, is best thought of as like the soft centre of a jam doughnut. Made up from a mixture of water (70%), prostaglandin (28%) and collagen (2%), the nucleus helps to maintain the outward pressure needed to support the compression loading through the disc structure. 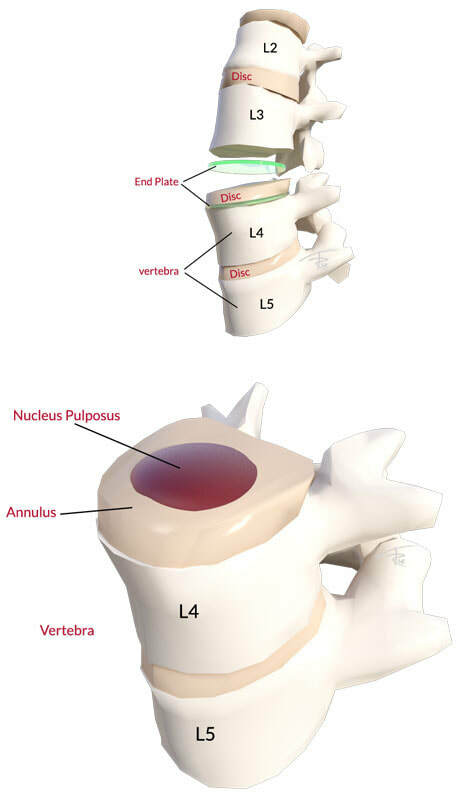 How does the Intervertebral disc work? The best way to think of the disc is to imagine its role within the spine as a 'spacer' between the adjacent vertebrae as well as a 'shock absorber'. The disc undergoes a constant repair/destruct cycle as it absorbs the forces we put through it, a process which is sustained by sufficient delivery in and out of the disc, of nutrients and metabolic waste. In childhood our discs have a direct blood supply enabling this exchange mechanism to occur effectively. At around the age of 18-20 however we loose this direct blood supply and the exchange process is thought to take place instead through very small channels in the end plates. Although this system remains effective in the most, it does appear to be more susceptible to failure with some theorising this is a key component in the onset of DDD. This may be why degeneration appears to be far more common after adolescence (adulthood), increasing in commonality with age. When the balance of this system falters the outward pressure of the disc begins to reduce (like a balloon deflating very slowly) and the annulus begins to loose its normal resistive properties, especially to its already weakest characteristic, compression, as well as torsional (twisting) forces. This can lead to acute, or chronic trauma, such as minor delamination, or splitting, of the annular layers ultimately altering the discs structural properties further. In some cases, most notably if this trauma occurs at the very back of the disc, where the sinuvertebral nerves supply, it has the potential to give you pain as well. It is very important to understand however that disc degeneration in its own right is considered NORMAL and having these changes DO NOT automatically mean you get pain. Degeneration only becomes a clinical issue when the disc, or other structures, have been altered in a way that gives rise to pain by some mechanism. As a physio I explain this A LOT (and I mean a lot!) to my patients who come to me with significant worry after being given a scan report that has umpteen big words related to degeneration written on it. More often than not these are simply signs that you are no longer 21 years of age (sorry to break the news to you) but do not mean you have a spine that is crumbling, breaking away, fragile, about to snap, going to confine you to a wheelchair if your so much as lift a feather, or even one that is especially different from the rest of the population. There is significant debate in the spinal research world, in which I am a very active participant, regarding how many MRI scans we should really be undertaking. Aside from the obvious financial implications to the health service there is a definite fear amongst some that poor, or irresponsible, 'translation' in to leyman terms for patients, can actually increase the chance of them developing unnecessary chronic conditions simply from 'sewing the seed' of fear or doubt. I am sure that most of you will agree that the power of suggestion, especially in an already worried or anxious person, can lead to all sorts of inappropriate and ultimately untrue scenarios/situations which can cause very negative, and quite destructive panic responses (we call this catastrophisation). When I first started my research role for spinal consultant, Mr Nick birch, at East Midlands Spine, Moulton, Northants, in 2009, one of my primary projects was that of the Genodisc project. This was a 5 year European funded project investigating the part genetics had to play in disc degeneration as well as the possible roles that cell therapies could play in the halting, or even reversal, of this process. Such is the medical value of the 3000+ database of people across Europe that we recruited, I am proud to continue to co-chair the steering committee, for this project, alongside Prof Jeremy Fairbank from Oxford. This group, made up of the clinical leads from the project, ensures that this valuable and finite resource is used in the best way to forward and develop our understanding of the disc. As a result of this project, and others, it is now thought that up to 70% of this 'degenerative disc' process can be explained by our genetics meaning that environmental causes such as jobs, hobbies etc may play much less of a roll than previously thought. This is especially true in the cases of younger patients (sub 30 years) where we would not normally expect to see these 'age related' changes. Do you get symptoms with DDD? The main symptoms of DDD are difficult to describe overall as it is entirely normal to see people with degenerate discs who have no back pain related to them at all. To hit this fact home further it is estimated that approximately 30% of the whole UK population, if scanned, would have clinically significant changes to their spine however many of these would not have, nor ever did and may in fact may never have, any symptoms at all. It is possible to get sharp pain from annular tears, due to the direct nerve supply at the back of the disc, but more often that not it is pain arising from other structures that may be over loaded or inflamed (such as facet joints), compressed (such as nerves), or mechanically irritated (such as spinal instability), due to the reduced health of the disc. The only way to clearly identify the presence and level of DDD is by MRI but this does not tell you where, or if, any pain is arising from so this differentiation needs skill and should be left to your surgeon or experienced therapist. At the end of the day, in the absence of any indicators of serious pathology or injury (Red Flags) it is widely acknowledged, as well a supported by a plethora of evidence, that exercise is the best way to combat most forms of back pain. What we don't know is which exercise is the best and truth be known, there are so many variables that could influence back pain, from the ways our brains all work differently (processing and controlling pain), to subtle differences in what is actually the root cause(s) of the problem, that we may never know. That is why we are proud to employ some of the best practitioners in the region, at Team Rehab uk, across both our clinics in Corby and Moulton, Northants, so that you can be sure you will get the best assessment and subsequent treatment (if necessary) to enable you to either get better, or self manage you condition, to the best of your ability.